It is a one ma(a)n show. I’m 32 years old and graduated mechanical engineer, who discovered his passion for guitar building three years ago. It started as i wanted to play a couple of unhuman solos from Kirk Hammett. I had to invest every free minute in exercises. That's how the idea came out: a flexible electric guitar that I can take and play anywhere. Travelect is a compact electric guitar with built-in amplifier and speaker. The guitar was designed to maximize the guitar playing time through the unbounded loctaion flexibility. Why should I buy such a special electric guitar? Why not. Travelect works like any other electric guitar with the addional luxury of an internal amplifier & speaker. Since you are no longer tied to one place. Living room, garden or park. You can now go heavy everywhere. How much does a guitar of yours cost? Depending on the wood and pickup selection, a guitar costs between 650-950€. A Personalized Travelect would cost 200€ in addition. Why are your guitars so much cheaper than traditional handmade guitars? By specializing in one body shape, all workflows are known and semi-automated. The building time is therefore shorter and as you know, time is money. Besides, I always wanted to own a handmade guitar and could never afford one. This should change for you. What can i change in the configuration? You can choose the woods and set different colors. Select other options and define your pickup combination. If you want other specific features such as a certain fretboard radius or other neck profil, I’m pretty flexible. Do I have a return policy? Yes. Of course you have 30 days right of return. You can easily send your guitar back in time. Provided the guitar is not personalized. How does it work with the personalization? 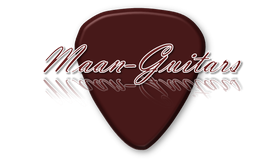 If you want to personalize your guitar, you can email me the symbol or icon you would like to immortalize on your guitar. I check the possibility and return to you with a 2D drawing. If you have configured your guitar and sent the form, i‘ll contact you with a quote for your configuration and delivery time. After agreement and a deposit of material costs the building would officially begin. What happens during the construction phase? You get regularly pictures and information of your guitar through the development process. Coloring is an important issue. After coloring, I always ask if the guitar looks the way you imagined it. Then you can look forward to your beloveth instrument. How long does the construction phase take? Is there an option for international shipping? Yes, but this will incur additional charges (about 50USD). Is it possible to build other guitar shapes? No. I'd like to focus on one form first to deliver perfect results for areasonable price. Do I have a guarantee? How long and on which parts? Of course. You have a 3 year warranty on all electronics parts and functionality. How often do I have to change the battery of a travelect? The battery lasts for more than 20 hours of use. Why is there no guitar in stocks at the moment? When do they come in? From time to time (depending on order situation) l put guitars for sale in stock. There is no specific period. It is rather irregular. How is the guitar shipped? In a package for guitars with a gigbag. There are a lot of ways to do so. Social media, E-mail or phone. Feel free to choose one of these options.